I love this little humming bird and you know what I'm like about birds carrying things about (see my blog banner) - he was bound to pick a leaf up eventually! You can see it a little more clearly in this photo. 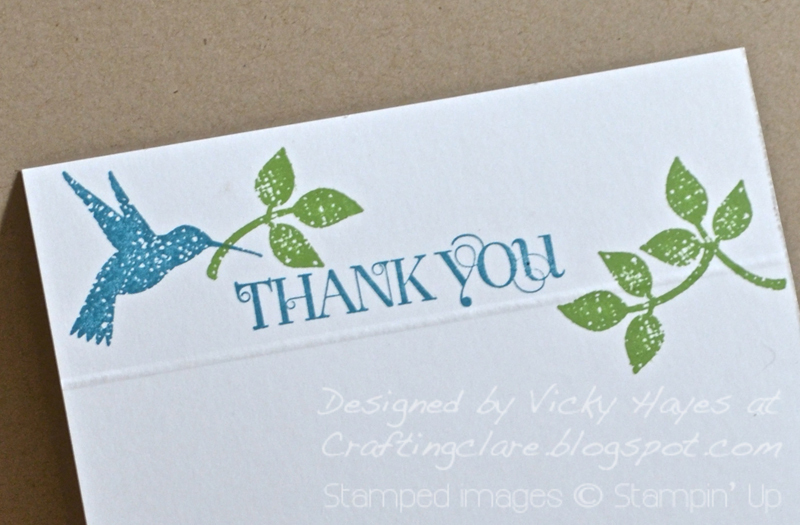 These are such simple images but the distressed texture gives them a lovely bit of dimension. 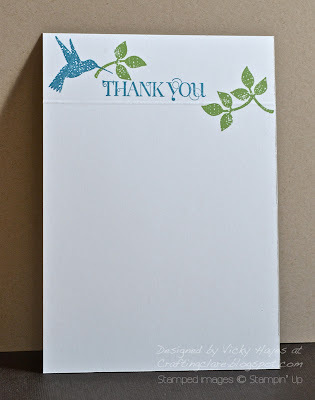 This is such a quick way to make a thank you note - cut a sheet of A4 card stock into four, score a line towards the top of one of the pieces, stamp the design and there you are! You can actually make quite a few of these in three minutes! My youngest son, who made this, informs me it's a snowfa! A fabulous set of Thank You cards. Those stamps are certainly appealing - pretty colours. Thanks for your comments on my blog re MMM. That card with the dimensional flowers and layers was entirely flat but it is really good how dimensional things can look with a bit of drop shadow etc and general tinkering in a graphics programme. I would normally print the elements separately and actually make it in layers - hybrid crafting!! the snowfa made me nearly fall of my chair laughing! Great note cards Vicky so pretty and very stylish and the scoreline is a perfect addition. Lovely cards. My son made a snowfa too! !